I’ve just returned home from my most recent adventure in Napa and Sonoma! I always have some very memorable tastings, and this trip started with one. 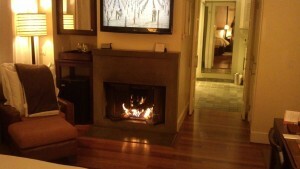 My husband and I stayed in one of the cottages at The Carneros Inn. We’re long time fans of Plumpjack’s wines and have always wanted to stay at their lovely hotel. For my birthday celebration we did just that! 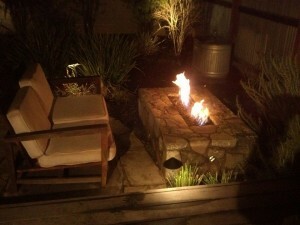 The indoor fireplaces and outdoor fire pits do not disappoint! Upon arriving at the resort we were seated at their registration desk and offered a glass of Merlot or some hot apple cider. Duh! Guess which one we chose???? Assuming that they’d be pouring one of their Plumpjack wines, we were surprised when they began telling us about the Adastra Merlot they were serving. We loved it! They offered to check with the winery to see if they had an available time for us to visit them for a taste. We were in luck and did just that! Surgeon Chris Thorpe and his Internist wife Naomi Thorpe founded Adastra. Started as a cattle ranch in 1984, they began planting vines in 1989. Their son-in-law Edwin Richards joined the team in 1995 as general manager. They began selling all of their Pinot Noir grapes to Etude in 1997, but began withholding a small amount to make some estate wine beginning in 2002. They also began farming organically in 2002, becoming certified organic (no easy task) in 2005. They currently have 20 acres of vines, of which they sell about half of their grapes to other wineries. Adastra produces about 1500 cases annually. We arrived at the winery on a cold rainy day. 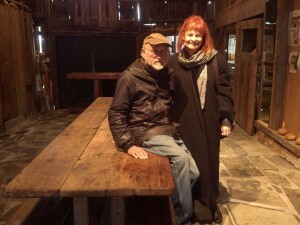 Dr. Thorpe showed us around, beginning in the barn where we learned some interesting history of the ranch. We also learned the origin of their name. Adastra comes from a phrase and sentiment that was loved by Naomi Thorpe’s father. The quote, “Per aspera, ad astra”, means “Through striving, to the stars”. It’s certainly appropriate for this winery, which has obviously been a lot of hard work, and produces some lovely wines. There are other astronomy connections with this winery, including the name of their winemaker. 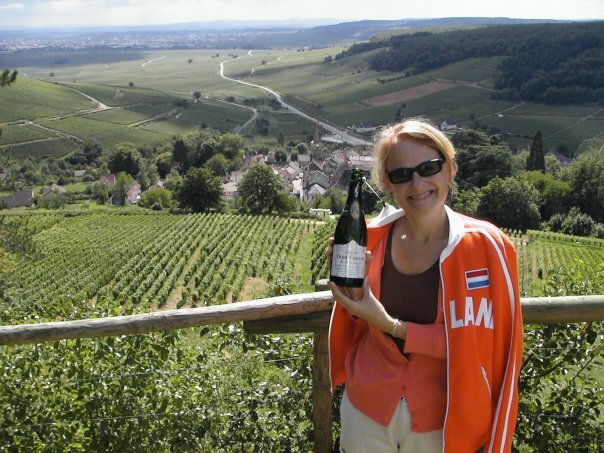 Pam Starr has been Adastra’s consulting winemaker since 1997. Formally with Spottswoode, Starr also has her own highly respected label, Crocker & Starr. Thorpe led us from the barn and into his warm, homey kitchen. We sat at his kitchen table, which sits under stained glass windows and overlooks the gardens, and tasted some wine! We started with their 2011 N’Oak Chardonnay, which obviously saw no oak. Still creamy due to lees stirring, this wine has citrus on the nose, and vibrant golden delicious apple on the palate. 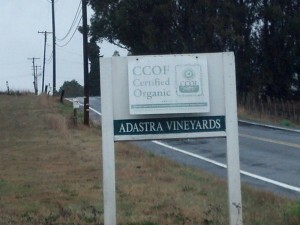 Their 2011 Adastra Chardonnay saw 100% French oak, 70% of which was new. This Chardonnay is made up of 5 different clones and has a lovely lemon curd palate and a long finish. We bought a couple of bottles of this wine. 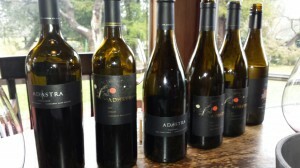 Another favorite of mine was the 2011 Adastra Pinot Noir. Made from 5 clones, including Joseph Swan, Dijon 115, Dijon 777, Pommard and DRC, this wine is lovely with cranberry and forest floor on the palate. The 2006 Pinot Adastra Proximus Pinot Noir is made from the Pommard, Dijon 777 and Dijon 115 clones. This is a bigger Pinot with lots of fruit and spice. My husband really liked this wine. The wine that we were served at The Carneros Inn was next up to taste! The 2010 Adastra Merlot had a long hang time, which produced a big, juicy wine. This Merlot is very easy drinking and has lots of plum and dark cherry on the palate. Their 2009 Adastra Proximus Merlot spent 2 years in mostly new French oak. Also loaded with plum and dark fruit, this wine has nice complexity and is well balanced. 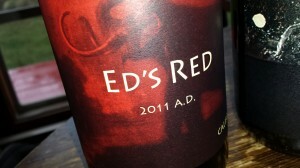 The final wine we tried was the 2011 Ed’s Red. Adastra’s second label, this wine is Edwin Richards’ baby. It’s a robust wine with lots of cherry and plum, along with a bit of licorice and spice. The 2011 vintage is a blend of 52% Merlot, 24% Zinfandel, 14% Barbera, 9% Petite Sirah and 1% Syrah. This wine is widely distributed and can be found in places such as Total Wine. At $18 retail, it’s a great everyday wine that goes well with many different foods.